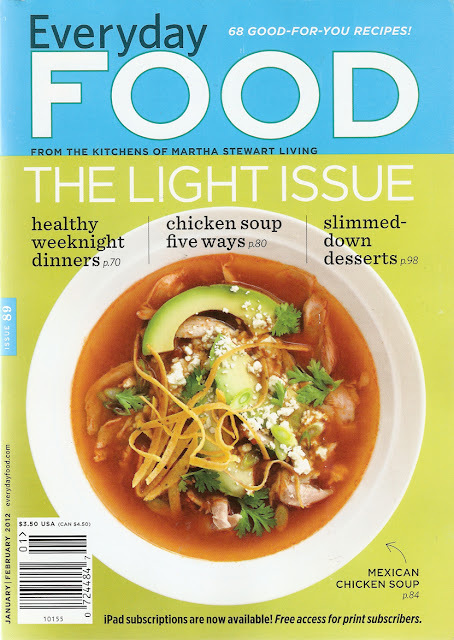 The January/February 2012 issue of Everyday Food arrived in my mailbox today and I immediately noticed the redesigned cover. I love it! It is much simpler, more refined, more captivating and certainly more modern: a wonderful design. Below is the new cover with some design notes. DESIGN NOTES: The word Everyday was given a capital letter and moved above the word FOOD. (It had previously been superimposed over the word.) The photograph of Martha in the top corner is gone. The colour band at the top was expanded to fill the entire top portion of the magazine, which looks much bolder. The phrase "A Martha Stewart magazine" below the title has been replaced with "From the kitchens of Martha Stewart Living," which was actually the original tag line. Oh no, I hate the new logo! There's nothing special about it, and poor timing since they just released a new cookbook with the "old" logo. I love it. The old one had too much going on: Martha's face, too many sub-headings. This one is clean and simple.